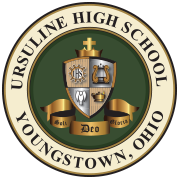 Ursuline High School offers an extensive Honors and Advanced Placement (AP) program as part of our college preparatory curriculum. The purpose of the program is to challenge those students who are academically gifted and to encourage them to share the gifts they have received with others. Students enjoy the challenge offered through an honors or AP course, while faculty find that AP courses enhance their students’ confidence, academic interest, and achievement. Those students enrolled in an AP course are actually taking college-level courses that could lead to college credit. All courses contribute significantly to student success on the ACT or SAT and in college. Due to the increased challenges of an honors/AP course student grades are weighted on a 5-point scale, as opposed to the traditional 4-point scale. For example, an A is worth 5 points instead of 4 when calculating a student’s grade point average. The English Department offers an honors course at every level. Students who demonstrate superior skills in reading comprehension, language use, vocabulary, and composition are invited into the English honors program. Students who then demonstrate success in their freshmen, sophomore, and junior honors classes will be placed in Advanced Placement Literature and Composition during their senior year and are eligible for college credit after successful completion of the Advanced Placement test. English classes help students to develop reading comprehension, critical thinking and writing skills. The honors curriculum in English requires summer reading. 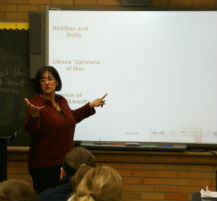 The Math Department at Ursuline offers an extensive honors curriculum. Students who score high on the eighth grade placement test enroll in Honors Algebra I. Honors Geometry and Honors Algebra II and Trigonometry follow the introductory honors math course. During the senior year students can then take AP Calculus in preparation for the AP exam or college entrance exams. Juniors and seniors also have the opportunity to take AP Computer Science Principles, an introductory course in the programming, coding, and basics of computer programming. For students who have a strong interest in, or plan for a career in science and meet the subject requirements, the Science Department offers the following courses: Honors Biology I, Honors Chemistry, AP Biology II, and AP Chemistry. Both AP courses contribute significantly to student achievement in college, even when students forego the actual AP exam. All courses include extensive lab work. For students with an interest in history, AP U.S. History is offered. The one semester review class can be taken as a junior or senior after students complete the normal U.S. History curriculum as sophomores. AP U.S. Government is offered to juniors with a high level of motivation and ability. This class is taken in place of the required government courses during the junior year. Both classes require students to use content knowledge for critical analysis, as well as extensive writing assignments. The Foreign Language Department offers two successful honors programs. Students who demonstrate success in their entry year of Spanish or French are then invited into the honors track. Both programs culminate with an AP class during the fourth year. AP Spanish and AP French allow students to take the AP exam to earn college credit or test out of foreign language requirements during college entrance examinations. New for the 2019-2020 school year, the Fine and Performing Arts Department offers two Advanced Placement programs, AP Studio Art – Drawing and AP Studio Art – 2D Art and Design. These are rigorous college level studio courses offered to highly motivated seniors who have taken Art I, II, III, and IV. Coursework is designed to build mastery in technique, composition/design, research, experimentation, and creative problem solving. Critical thinking, objective analysis of artwork, and the ability to communicate in the language of art will be developed throughout the course. Students must be willing to devote several hours per week of outside time to art production, research, and self-improvement. Maintaining an active art journal/sketchbook is a critical course requirement. The “exam portfolio” requires at least 24 high quality artworks to be completed and submitted to the College Board in May. Students will declare their choice of portfolio early in the year, 2D or Drawing, and work in and out of the classroom fulfilling the requirements.